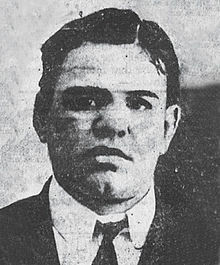 Sometimes called the last of the “unorganized criminals” because his reign ended just before Arnold Rothstein’s rise to power in the much written about organized crime of the Mafia; Monk Eastman was an interesting character. There are several mythical accounts of who he was, what he said, and what he did. It’s likely that a thread of truth is woven through each. A New York City thug, he acquired the moniker “the Monk” because of his small stature and great ability to climb in and out of windows, swinging from fire escape ladders like an acrobat, during his early criminal pursuits. He was first arrested in 1898 for larceny and sent to Blackwell’s Island. His association with criminal gangs began there. After his release, Monk went on to form one of the five most infamous gangs of the era, the Eastman Gang, boasting a membership of 1200 thugs. They engaged in a hodge-podge of criminal offenses, from pimping to murder for hire. He was protected by New York’s infamous “Tammany Hall” political machine, which is why his next arrest didn’t come until 1904. His gang members provided a variety of services for the Tammany Hall crowd, including voting for their chosen candidates, usually several times in each election. Finally, however, Monk went too far. In 1904, he was accused of shooting at two Pinkerton agents. Fed up with the bad publicity generated by Eastman, Tammany Hall didn’t help this time. He was sentenced to 10 years in Sing-Sing Prison. When WW I began, the Monk was 42 years old (some accounts say he was 44). Due to his stint in prison, his gang had all but disintegrated, so he joined the army! During the physical, the doctor was stunned by the vast number of scars, from knife wounds to bullet-holes covering his body. 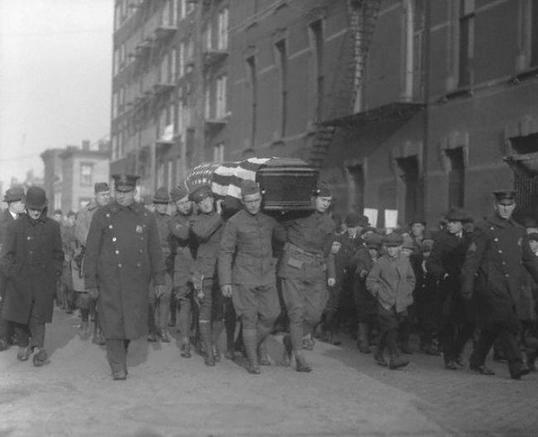 When asked if he had served in combat previously, he responded, “Oh, just a lot of little wars around New York.” He was accepted and served in France with “O’Ryans Roughnecks”, the 106th Infantry Regiment of the 27th Division. He came home to a hero’s welcome. His exploits on the battlefield were repeated and probably exaggerated often. It was a successful marketing scheme, however, as in 1919, Governor Al Smith recognized his service and restored his citizenship, previously lost due to his criminal conviction. As the year 1920 came to a close, Monk Eastman had returned to a life of petty crime. In December he was shot and killed by corrupt Prohibition agent, Jerry Bohan, who was eventually convicted and served three years for the offense. He is featured in a 1933 short story, Monk Eastman: Purveyor of Inequities, and a novel written in 1999, Dreamland. His infamy might have reached greater heights, but for the gangsters whose careers overlapped his. Those men were the likes of Arnold Rothstein, Al Capone, Lucky Luciano and a host of other “mobbed up” crooks. Fascinating profile of a guy with a bullet-shaped head, lead a gang of 1200 thugs, smacked women around (without his brass knuckles, of course), joined the army, and returned to a hero's welcome. Is this a great country, or what?